Need more information about booking Home 163188 ? 2 bedrooms & 2 bathrooms (sleeps 4) . Kingsize bed in the en-suite bedroom. This Apartment has 2 bedrooms, 2 bathrooms and sleeps 4. It’s been listed on Holiday Lettings since 21 Apr 2011. Located in Scotland, it has 91 reviews with an overall rating of 5. The average weekly rate varies from £780 to £1290. This is our third stay at McDonald Street; the perfect place to base ourselves for a rugby weekend. Central but quiet part of town with great facilities in the apartment. Terry and Ann are very accommodating and regular friendly e-mails to confirm all our details and requirements. Thanks again and we will be back! Perfect place for my friend Cathy and me to spend 9 glorious days in the fabulous city of Edinburgh. Lots of room, with two bedrooms and 2 baths....we loved the privacy that provided. Not far from The Royal Mile, we had lots of things to see and do. Bus stops close by, with grocery stores handy. The owners were quick to get back with answers to our questions, and the extras, (coffee, milk, fresh flowers etc.) were truly appreciated. If ever we are fortunate enough to venture back that way, this is definitely the place we’d stay! Owner's reply: Thanks for staying with us and for your review with your kind words. Hope you come back from Nova Scotia to visit us again! This was the second time we have stayed in this apartment. It's perfect, and so many extra touches such as the welcome pack and even flowers on the table. It's spotlessly clean, comfortable, within easy walking distance of the centre and on a bus route too. We would not think of staying anywhere else whilst in Edinburgh. Definately 5 star! Owner's reply: Thanks for coming back and staying with us. Really appreciate you taking the time to review our apartment and for your kind words. Hope you manage to come back and stay with us again. 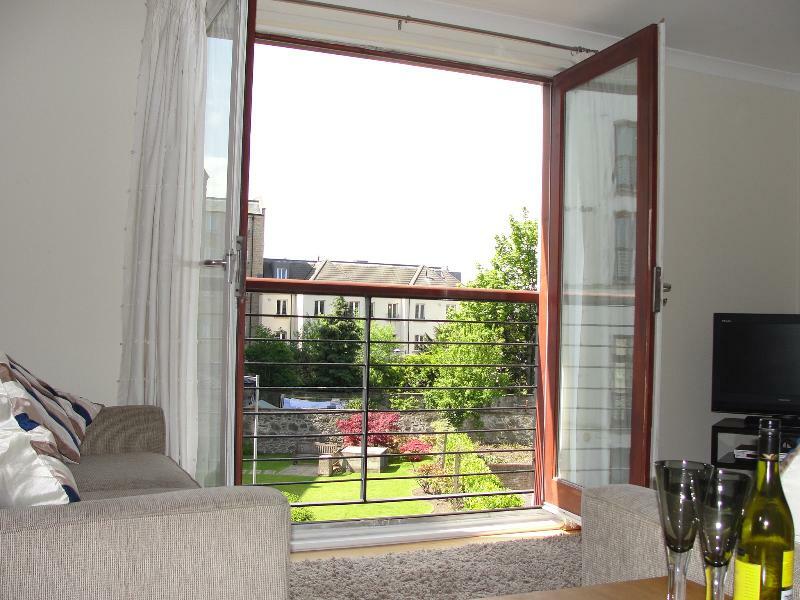 This is a comfortable location with all conveniences close to the town centre. Ideal to visit Edinburgh and the surroundings. To be recommend. Owner's reply: Really appreciate you taking the time to review our apartment. Pleased to hear you had a good time and hope you come back and see us again. We're a family of 4 and we stayed several nights in this apartment. It's a great place in a great location with everything you need. Good restaurants, shops, close to city centre, easily accessible by bus. The owners were very helpful and quick to answer emails. I would definitely recommend this. Owner's reply: So good of you to take the time to send a review. Glad your family had a great stay - hope you can come back and see us again in the future. The apartment is in a great location with many local restaurants to choose from and close to Princess Street. All the brochures were very helpful and the parking was a real plus. It has a bright, open outlook and is very well equipped and we enjoyed our stay - some block-out blinds, especially for the summer months, would be a great addition! Thanks! Owner's reply: Appreciate you taking the time to post a review. Hope you come back to stay with us again in the future. Great accommodation, my partner & I brought her parents to Edinburgh for a few nights and the apartment was a superb base! Very well equipped & comfortable, guide books, board games etc all provided!! Owner's reply: Many thanks for taking the time to review our apartment. Pleased to hear you enjoyed your stay with us and hope to see you again. This was our first visit to Edinburgh (2 adults and 2 children) and the apartment suited us perfectly. The parking was a great facility and with such a good location meant we didn't need to drive anywhere once we'd arrived. We bought an Edinburgh Pass and used the bus tour to visit the Royal Yacht at Leith. Carried on the bus tour afterwards and got to see the city with running commentary. The Royal Mile is within walking distance of the apartment so you can easily see the Castle at one end and the Scottish Parliament at the other. Other sights to see are Grey Friars Bobby and Arthur's Seat is definitely worth the effort. Sadly ran out of time to see other attractions, so plan to return very soon. Lots of information in the apartment of places to see and general information for our stay. The apartment is a good size with all you need to enjoy a comfortable stay - even borrowed a DVD for the night and watched Braveheart :-) Only an observation, but the wooden floor was a little creaky, wouldn't put us off booking again as this was such a lovely place to stay. Plenty of restaurants nearby and a handy Co-Op shop practically next door. Thank you for letting us stay in your apartment and we thoroughly enjoyed our first trip to Edinburgh. Owner's reply: Many thanks for taking the time to review our apartment and glad to hear you had a great stay. Always interested to hear what guests do on their break in Edinburgh - good tips there for a family. Come back ad see us again soon! The apartment was perfect for our 8-night stay: very comfortable; well-appointed with everything one could possibly need (including dishwasher, washer/dryer, etc etc); warm; and in a great location, very close to pubs, restaurants, shops - and easy walking distance to downtown tourist attractions. Would recommend the tram from the airport to York Place - then an easy walk to the apartment. We enjoyed Mamma Rona's for Italian food, and Jeremiah's Taproom for a pub, but we ate well elsewhere as well. We rented a car for the last portion of our stay, so having parking available was a definite plus. Would definitely stay here again! Owner's reply: Appreciate you taking the time to send a review and good to hear you had a great stay. We really like hearing where our guests go to eat ad drink! Really useful for future guests and for us when we stay! Haste ye back! Owner's reply: Thank you for your kind comments and pleased you had a great stay. Come back and see us again soon! You can get in touch with Terry (the owner) through the contact form on this page. Send Terry (the owner) an email through the contact form on this page. Alternatively, if there’s a phone number on this page, you can call them. How do I contact Terry (the owner)? You'll need to send Terry (the owner) an enquiry to book - the owner will let you know how to pay. If they accept online booking they'll send you a quote and info on how to pay. If you pay through our website you’ll be covered by Payment Protection. Or you can send Terry (the owner) an enquiry through the contact form to request a quote. Terry (the owner) will email you the total cost for your dates and how to pay. Send Terry (the owner) an enquiry through the contact form requesting a quote for your holiday dates. Terry (the owner) will email you the total cost for your dates and how to pay. Terry (the owner) of this property is responsible for taking and refunding your damage deposit. The damage deposit terms should be agreed before booking and outlined in the booking contract, if Terry (the owner) supplies one. Please refer to these details or contact Terry (the owner) directly if you have any questions. You'll need to contact Terry (the owner) to cancel. They should have provided their contact details when you made your booking - otherwise, email them through the contact form. You'll need to contact Terry (the owner) to edit your booking. They should have provided their contact details when you made your booking - otherwise, email them through the contact form.